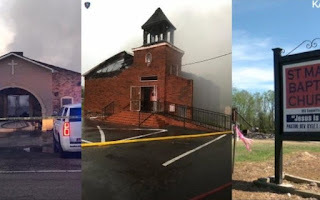 The Jewish Federation of Greater New Orleans and the Anti-Defamation League regional office in New Orleans issued a joint statement of solidarity with the three historically-black churches that were torched in central Louisiana in the past couple of weeks. The first fire broke out on March 26 at St. Mary Baptist Church in Port Barre. Greater Union Baptist Church burned on April 2 and Mount Pleasant Baptist Church was set on fire on April 4. On April 10, 21-year-old Holden Matthews was arrested and charged with the arsons. A brand of gas can sold at Wal-Mart was found at the third arson site, and Matthews had bought that type of gas can at a Wal-Mart on March 25. He also drove a vehicle that matched the description of the vehicle seen on video footage near both churches shortly before the fires. Cell phone records also placed him near all three churches shortly before the fires broke out. Holden is the son of a parish sheriff’s deputy. The state fire marshal, Butch Browning, said indications are that Holden was into “black metal” music that centers on Nordic beliefs and heathenism, and has been connected to church burnings elsewhere in the world. They encouraged donations to a GoFundMe page that has been established to help rebuild the churches. On April 4, Rabbi Gabe Greenberg of Beth Israel in Metairie traveled to Opelousas to visit the first two churches that burned, as this was before the third arson. “As the rabbi of a community that lost its own building to a flood, and having personally experienced losing a home in a house fire… I am strongly feeling the pain of these parishioners,” he said.